On March 24th, California’s Air Resources Board (ARB) published findings from its study on how the state’s Global Warming Solutions Act of 2006 (AB 32) could impact California’s economy. How will AB 32 impact household income? ARB’s analysis looks at more than 70 measures in the AB 32 Scoping Plan that will be used to reduce greenhouse gas emissions (GHG) as directed under the act. The measures fall into six categories and are expected to account for reductions of 60 million metric tons (MMT), which is about 60% of the reductions needed to meet the goal of cutting 2020 emissions to 1990 levels. It’s critical that ARB has clear and effective ways to reduce GHG emissions. It’s also key to note that many of these measures will save households and businesses money on transportation and energy. Smilar to the economic impact on jobs, the aggregate-statewide effect of AB 32 on household income is small. 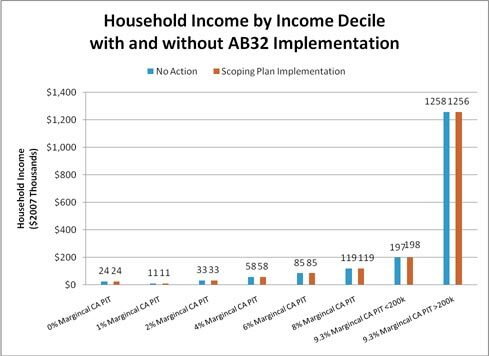 The ARB found that the AB 32 plans will provide a 0.1% improvement in personal income. How can it be that energy users save when fuel prices rise? ARB estimates that while the cost for each unit of energy will rise as a result of AB 32, we will use less because of efficiency. As efficiencies increase, it is likely that monthly bills will decrease. For example, ARB modeling indicates AB 32 will inspire additional residential sector investments of more than $1.5 billion on devices, processes and operations in 2020, with sector savings of more than $2.2 billion in avoided household and transportation fuel expenditures. Devices include more efficient appliances, such as compact fluorescent light bulbs, new refrigerators and programmable thermostats. Processes include better utility outreach programs geared for low-income ratepayers. Operations can include automatically adjusting lighting and temperature controls and water-moisture gauges that activate drip irrigation. 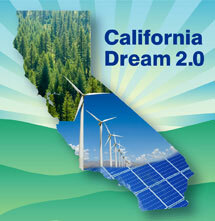 AB 32 is also expected to save drivers $4 billion on fuel expenditures by 2020. ARB based these findings on the assumption that California’s cap-and-trade program will involve some buying and selling of pollution permits, and that all the permit value will remain in California and be returned to households. ARB is developing a program (details will be released later this spring) that will likely combine administrative distribution and auctioning of permits. A core goal of the program is to protect consumers and avoid “leakage” (i.e., loss of emissions and jobs to other regulatory jurisdictions). This entry was posted in Climate, Global Warming Solutions Act: AB 32. Bookmark the permalink. Both comments and trackbacks are currently closed.